Every March, Adrienne Chan’s mind turns to giving. That’s the month she lost her sister Caroline in 2013, and when she takes time to reflect on that loss, it reminds her to make a donation to the bursary fund she created in Caroline’s memory. But it’s not the only time she gives, or the only fund she gives to. 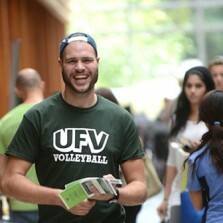 Adrienne, who is Associate Vice President, Research, Engagement, and Graduate Studies at UFV, believes in supporting education as a fundamental way of fostering citizenship. Adrienne thinks back to when she herself was a student, waiting on tables to make ends meet. Adrienne and her family have been supporting education for more than 30 years. Since that time, they have created bursaries to honour their parents. And when Caroline passed away, Adrienne honoured her memory with a bursary. Adrienne’s professional background is in social work, so much of her giving is targeted to students in that discipline. “Being a donor has many rewards. There is a satisfaction that you’ve made a contribution to someone`s life and to their future. I often receive letters and notes from recipients at universities and colleges where I am a donor. My sister used to collect all of these in a file and proudly read through them every once in a while. “Neither my parents nor my sister — who had a learning disability — completed high school. Yet their belief in education was strong, as a means to better society and to better ourselves. I think that one of the gifts we give ourselves is the gift of being a donor. It has its own rewards. The students who have received bursaries funded by Adrienne are grateful for her support. “It is truly the small things in life that count the most. Thank you, Dr. Chan, for supporting my academic journey allowing me to pursue my dreams,” says bursary recipient Alexis Christie. 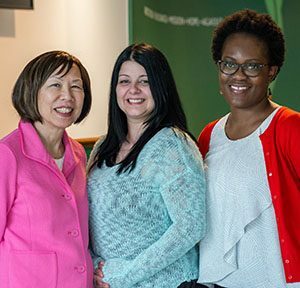 Pictured above: Adrienne Chan (left) with 2016 Chan Bursary recipients Alexis Christie (centre) and Elizabeth Jonas (right).